If you follow the tech industry closely, the one thing that pops up on your mind when you have to recall what’s happened in the year 2016 is the Samsung Galaxy Note 7 fiasco. The so-called best smartphone of 2016 was discontinued officially after several units of the phone caught fire. Rumors say that the phone ‘Note’ will be killed after all and Samsung will come with something new to retain the brand reputation. However, a few months ago, Samsung buried all the rumors regarding the end of Note lineup and said that a new smartphone would surely come under the same series later this year. Going by Samsung’s naming convention over the years, the South Korean giant will surely call it ‘Galaxy Note 8?. 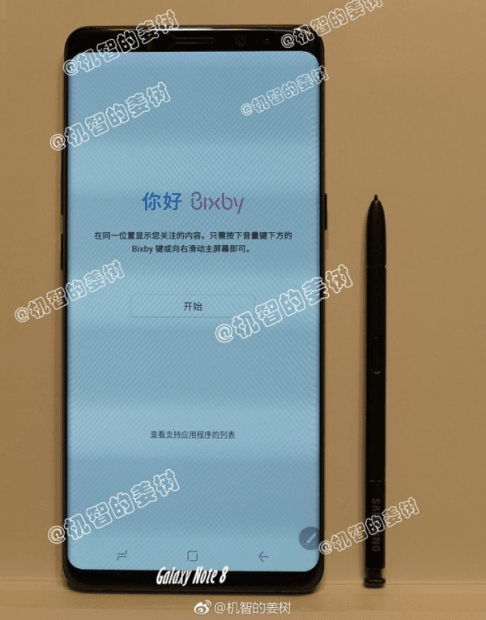 The image also has the S Pen placed beside the handset. So, it’s now evident that the phone will come with S Pen, which is the trademark feature of the Note series. The phone in the image looks a lot similar to the Galaxy S8+ in terms of dimensions. Samsung has to trim the battery size in the Note 8 in favor of S Pen if they’re planning to use the same footprint of Galaxy S8+ and that would be weird enough for the Note 8 to pack smaller battery than the S8+. Apart from the S Pen, Samsung should add a dual camera setup in the Note 8. If they go with the same single camera setup, it will disappoint masses out there. Samsung usually unveils a new Note smartphone in August every year, which is almost four months away from now. Rumors like these are very early to trust, so take them with a pinch of salt. Samsung Galaxy Note 8 to Bring Along These Features When It’s Launched in August 2017!